James Sutherland died at Achingoul 17th April 1906 aged 40. Wife Janet McAngus died at Knockally Dunbeath 4th October 1904 aged 33. Son James Alexander Sutherland died in Tanjanyika East Africa 20th August 1929 aged 30. 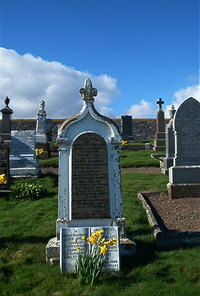 Sister Johan Sutherland died at Overdale Dunbeath 10th August 1953 aged 92. John McKay died at Corstorphine Edinburgh 17th March 1968 aged 77. Wife Dolina C Sutherland died 11th April 1969 aged 74.
d Janet Sutherland died 25th January 1998 aged 67.